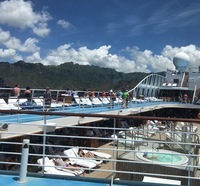 We are not new to cruising as this was our 15th cruise but the first with Oceania. 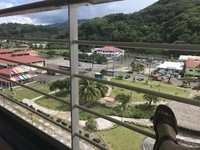 We were attracted to Oceania because of the French Polynesia itinerary as well as its reputation for good service and food. We absolutely loved the itinerary as well as the very good service by our cabin staff and butler as well as the food in the specialty restaurants. However, we found that the added costs were not compensated by our expectations for value. To begin, we were very disappointed by how we were received upon boarding as well as departing. Our experience with other cruise lines has been that we were greeted with a welcoming drink as well as food available. Likewise, upon departure, we have been provided with coffee and muffins/danish etc. None of this was available on the Marina. We arrived with 200+ people on our 8 hour overseas flight. There was no welcoming drink and by the time we checked in, all food services were shut down. One would think that a table of refreshments would have been provided by the ship. Similarly, upon departing at an early hour (5:40 am), that coffee and a muffin could also have been provided. This was neither a good first or last impression of the cruise. As part of our booking, we were provided with free unlimited internet access. This was a total joke since access was not available in most parts of the ship. Moreover, it was impossible to upload or download photos or documents. Finally, it was impossible to contact others via FaceTime or Skype. On all of our other cruises, this was never a problem, I then learned that for an added $15/day, I could upgrade to unlimited streaming. I did so. However, although I could sometimes (but not always) access FaceTime, I still could not upload photos or download documents. This was particularly concerning since I needed to be reached due to an ill family member. Needless to say, this caused considerable stress. I enjoy working out. The fitness center was tiny and the room for classes was even tinier. On a positive note, the fitness instructor, Diana was superb. She knew her stuff, was inspirational and very nice. There was a sign up sheet for classes which was done to limit the number of passengers attending. However, the fitness staff let in whoever showed up. As a result, there was often 20 passengers in a class that was listed for 12. This made the experience challenging and at times, unsafe. The Terrace Cafe had a limited variety of food. At times, I would have loved to have a scoop of tuna or egg salad. This was never available. Although a crew member was immediately available to serve us water, coffee or juice, anything else was simply unavailable. On three occasions I asked for sparkling water and never received it. The dining room was very pleasing. The staff was great. But the food was hit or miss. Some was excellent while others, just awful. The speciality restaurants were excellent. We especially enjoyed the Red Ginger. We found the cruise offered excursions outrageously priced. We only took one excursion from the ship - a one hour glass bottom boat right for $129/person. We enjoyed it but it was very overpriced. Alcohol prices were similarly overpriced. I didn&apos;t order one drink the entire time I was onboard - simply out of principle. The most outrageous cost was the airport to port & return transfer. Since we our flight arrived at 9:40 pm and left at 8:40 am and because we were unfamiliar with the services in Papaeete, we decided to take the transfers. Each one way transfer was $129/person. The ride was under 10 minutes. Worth of all, there were delays at each end. This was utterly ridiculous. From now, we&apos;ll stay with Celebrity our preferred cruise line. 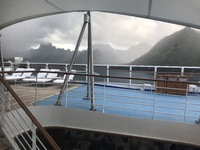 We are not new to cruising as this was our 15th cruise but the first with Oceania. 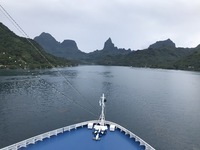 We were attracted to Oceania because of the French Polynesia itinerary as well as its reputation for good service and food. We absolutely loved the itinerary as well as the very good service by our cabin staff and butler as well as the food in the specialty restaurants. However, we found that the added costs were not compensated by our expectations for value. To begin, we were very disappointed by how we were received upon boarding as well as departing. Our experience with other cruise lines has been that we were greeted with a welcoming drink as well as food available. Likewise, upon departure, we have been provided with coffee and muffins/danish etc. None of this was available on the Marina. We arrived with 200+ people on our 8 hour overseas flight. There was no welcoming drink and by the time we checked in, all food services were shut down. One would think that a table of refreshments would have been provided by the ship. Similarly, upon departing at an early hour (5:40 am), that coffee and a muffin could also have been provided. This was neither a good first or last impression of the cruise. As part of our booking, we were provided with free unlimited internet access. This was a total joke since access was not available in most parts of the ship. Moreover, it was impossible to upload or download photos or documents. Finally, it was impossible to contact others via FaceTime or Skype. On all of our other cruises, this was never a problem, I then learned that for an added $15/day, I could upgrade to unlimited streaming. I did so. However, although I could sometimes (but not always) access FaceTime, I still could not upload photos or download documents. This was particularly concerning since I needed to be reached due to an ill family member. Needless to say, this caused considerable stress. I enjoy working out. The fitness center was tiny and the room for classes was even tinier. On a positive note, the fitness instructor, Diana was superb. She knew her stuff, was inspirational and very nice. There was a sign up sheet for classes which was done to limit the number of passengers attending. However, the fitness staff let in whoever showed up. As a result, there was often 20 passengers in a class that was listed for 12. This made the experience challenging and at times, unsafe. The Terrace Cafe had a limited variety of food. At times, I would have loved to have a scoop of tuna or egg salad. This was never available. Although a crew member was immediately available to serve us water, coffee or juice, anything else was simply unavailable. On three occasions I asked for sparkling water and never received it. The dining room was very pleasing. The staff was great. But the food was hit or miss. Some was excellent while others, just awful. The speciality restaurants were excellent. We especially enjoyed the Red Ginger. We found the cruise offered excursions outrageously priced. We only took one excursion from the ship - a one hour glass bottom boat right for $129/person. We enjoyed it but it was very overpriced. Alcohol prices were similarly overpriced. I didn&apos;t order one drink the entire time I was onboard - simply out of principle. The most outrageous cost was the airport to port & return transfer. Since we our flight arrived at 9:40 pm and left at 8:40 am and because we were unfamiliar with the services in Papaeete, we decided to take the transfers. Each one way transfer was $129/person. The ride was under 10 minutes. Worth of all, there were delays at each end. This was utterly ridiculous. From now, we&apos;ll stay with Celebrity our preferred cruise line. Very enjoyable but extremely overpriced for a one hour excursion.